Not a single revival or even a momentary glance backward. How else would an unconventional institution like Dance Theater Workshop celebrate its 40th anniversary? Look for a glorious season of premieres by artists committed to pushing the artistic envelope. Be armed for surprise. And who are the surprise-makers? Jennifer Monson/Bird Brain; Jeanine Durning; Yoko Higashino & Hiroaki Umeda; Bebe Miller Company; Ann Liv Young; Jodi Melnick & Scott Heron; Donald Byrd/Spectrum Dance Theater; The Barnard Project; Fresh Tracks; Miguel Gutierrez and the Powerful People; Pascal Rambert/side one posthume theater; and Caden Manson/Big Art Group. All have new works. There will also be DTW’s Family Matters series and the brand new Studio Series created to show works by first-time choreographers and curated by DTW artists. “Each year for the last four decades, DTW has encouraged artists to discover new ways to consider movement, choreography and theater. It may be the only dance venue in New York that has its mission built into its name. And with our glorious new facilities, now three years old, we can offer artists much greater opportunities to experiment and stage work in even more unique ways,” said Marion Koltun Dienstag, DTW’s executive director. Point in fact: Jennifer Monson’s new work “Flight of Mind” will take audiences on a trip throughout DTW where music generated by the building itself and hundreds of live plants turn the facility into its own art installation, while Jeanine Durning’s “out of the kennel into a home” extends from the Bessie Schönberg stage to the confines of a 15-foot truck parked outside the theater. And those are only two ways that DTW artists will catapult expectations about dance and theater in totally new directions. DTW will also present premieres by two of its most distinguished alumni—Bebe Miller and Donald Byrd, whose works exploit the institution’s new technological possibilities. In keeping with her subject matter—the migration paths of ospreys, gray whales, ducks and geese, which Jennifer Monson tracked for over 7,000 miles as part of her Bird Brain project—the choreographer’s “Flight of Mind” creates a migration for the DTW audience itself. Fascinated by the flow of movement in nature, Monson guides both performers and spectators throughout the building in this world premiere. The original sound installation will be performed live by composer David Kean and Kenta Nagai. Adapting sections from memoirs of escape artists and prisoners, Jeanine Durning explores the nature of mental and physical confinement in “out of the kennel into a home,” a world premiere. Breaking out from the confines of the stage––and even the building itself––to a truck parked outside, the dance is set to an original score by London-based composer Jules Maxwell, with text by playwright Keith Reddin. The work for six performers also incorporates video by Jason Akira Somma. Please note: Prior to Jeanine Durning’s show on September 30 & October 1, at 6:30pm, there will be a free Studio Series performance of work by Eric Bradley, curated by Durning. Highlights of the contemporary Japanese dance scene will be briefly transferred to the DTW stage when two of Japan’s most talked-about young artists present U.S. premieres. The recipient of the 2004 Toyota Next Generation Choreography Award, Yoko Higashino takes inspiration from Japanese pop culture in her “ALARM! – zero hour edition.” In Hiroaki Umeda’s “while going to a condition,” a solo for the choreographer, sudden flashes of light cut across the dark stage, illuminating Umeda’s quick, fluid movements. In addition to the choreography, Umeda also created the sound, images and lighting design that accompany the piece. Nurtured by DTW as a young artist, Bebe Miller returns to the theater for her company’s 20th anniversary—under dramatically different circumstances. With the use of DTW’s new technological facilities, Miller is now able to integrate digital motion capture technology, animation and video projections into her work. In “Landing/Place,” a New York premiere inspired by her travels to Eritrea, Miller merges her sensuous, intimate choreography with digital animation by Vita Berezina-Blackburn and media by Maya Ciarrocchi. The score will be played live by composer Albert Mathias. In her first evening-length piece, “Michael,” a world premiere, Ann Liv Young situates seven performers, including herself, within the interior of a mobile home. Raw and highly sexual, “Michael” draws on tap, hip-hop, club and pedestrian movement, which she integrates with pop songs, beat poetry and saxophone music, as well as text from journal entries and dialogues. Audiences get a double dose of dance in the twin bill of world premieres by Scott Heron and Jodi Melnick. Heron’s “Flossing and Other Dances” is a suite of three solos (“Flossing,” “Gumdrops and Cupcakes” and “3X Donovan”) that highlight the choreographer’s gift for transformation. With equal aplomb, he appears as a box of dental floss and then as a woman with a tragic tale. The newest work, “Gumdrops,” features music composed and performed live by Corey Dargel. Bessie Award-winner Melnick presents her “Wanderlust, Kentucky,” a solo that imagines a series of episodes occurring in the invented town of Wanderlust. More information on the Melnick work to come. Years after developing his early work at DTW, Donald Byrd returns as the new artistic director of Seattle’s Spectrum Dance Theater, which will make its New York debut with the local premiere of Byrd’s “The Sleeping Beauty Notebook.” Though set to the Tchaikovsky score, Byrd completely reconfigures the classic story by creating a layered, dream-like examination of beauty, evil, gender and social order. His structural strategies include omitting and condensing scenes from the original tale, while imaginatively expanding on others; his movement combines contemporary dance theater, burlesque, ballet and pantomime. The whole world is invited to celebrate DTW’s 40th birthday with a building-wide party featuring performances, snacks and drinks on all three floors. The dance party takes place here, there and everywhere: the DTW terrace is the scene for a digital performance; Susan Marshall’s company members will commandeer the Executive Director’s office; while excerpts from Donald Byrd’s new work will be seen in the theater. “The Barnard Project” is a collaboration between DTW and Barnard College in which DTW artists are in residence at the school working with students. The shows, which feature the college’s students performing works by Ori Flomin, David Parker and Donna Uchizono, culminate the innovative, newly established residency program. Fresh Tracks, DTW’s longest running series, has been presenting works by young choreographers since 1965. Alums include Bill T. Jones, Anne Teresa de Keersmaeker, David Parsons and Molissa Fenley. This fall’s performances offer a range of new work by promising artists. Stay tuned for names and details. Miguel Gutierrez’s world premiere of “Retrospective Exhibitionist” promises an unusual welding of form and content. A solo performed by the choreographer accompanied by live and recorded video, the work investigates the narcissism, vulnerability and seduction inherent in performers. Also on the program is “Difficult Bodies,” a trio whose title originated when Gutierrez overheard a teacher describe “difficult bodies,” or physiques not fit for dancing. The dance, also a premiere, questions the distinction between internal and external experiences. Please note: Prior to Miguel Gutierrez’s show on December 2 & 3, at 6:30pm, there will be a free Studio Series performance of work by Anna Sperber, curated by Gutierrez. Using Dante’s “Divine Comedy” as a point of departure for his “PARADIS (unfolding time),” Paris-based choreographer Pascal Rambert unites text and movement in his exploration of disenchantment and vulnerability. The nakedness of the ten dancers, who perform on the outer edges of colorful carpets illuminated by neon lighting, recall man’s innocence before his expulsion from Paradise. Big Art Group’s “House of No More” opens with a performer’s reenactment of a crime before it rapidly diverges from reality, becoming contradictory and self-eradicating until finally the spectators are forced to question their own perceptions of the stage action. The work is the third and final installment of Caden Manson and Jemma Nelson’s trilogy of “real-time film” for which the two artists combined live video layering, green screen technology, choreography and sound design to create an on-screen story in real time. Curated by Keely Garfield and Peggy Peloquin, the popular series “for children and their adults” returns with three imaginative programs: “Starring Movie Moxie and the Make Believers” (October 1); “Masquerade Ball for Costume Dramas” (October 29); and “Holiday Delights and Sights in Tights!” (December 3). All tickets, including DTW’s 4 for 40% Club, member, artist and student discounts, are available at the box office, by calling 212-924-0077 or online at www.dtw.org. Dance Theater Workshop is located at 219 West 19th Street, between 7th and 8th Avenues. FOUR DECADES OF ASSISTING CREATIVE ADVENTURES: DTW was created by artists for artists, and over the years it has evolved as the needs of the field have changed. To help give once unimagined possibilities to its artists, DTW’s new building houses an Artists Resource Media Lab, where choreographers exploit its state-of-the-art facilities to bring their work into another dimension. Video recording, editing, compositing, DVD and CD-Rom producing, graphic, web and sound design and international communication are just some of the means. DTW’s two dance studios, wired so that rehearsals can be recorded and choreography easily edited, offer artists a chance to work in depth over time. With the DTW Gallery, which presents visual arts, media installations and digital presentations on one side and an open view of the comings and goings on West 19th Street on the other, the Lucky Star Café has become a kind of dance central station for the artists and the public, where thoughts and ideas are exchanged in a casual setting. DTW’s helping arm to artists extends far beyond its West 19th Street headquarters. Among its myriad programs are: financial assistance to artists who locate and work in spaces outside Manhattan; group insurance to its member artists; and membership in a credit union. 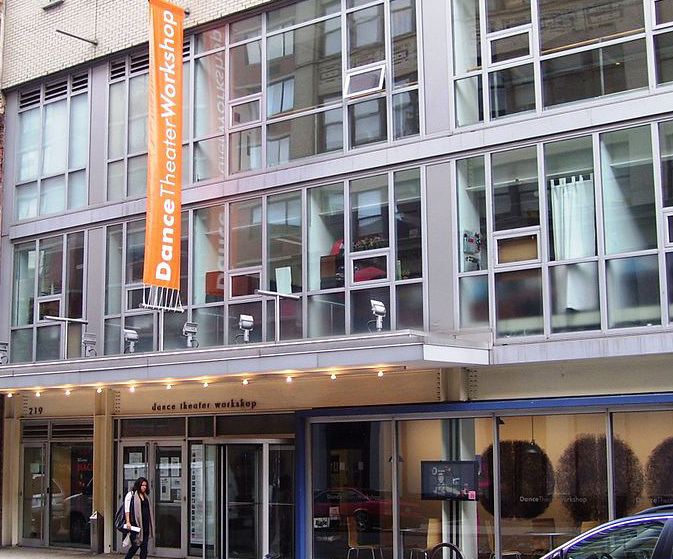 Founded in 1985 by DTW, both the Suitcase Fund, which supports international research and residency programs, and the National Performance Network, which funds national artist residencies, offer artists increased exposure for their work, as does New York State DanceForce, created by DTW in 1994 to subsidize state-wide performance residencies. DTW’s 2005–2006 Season is sponsored in part by Altria, National Endowment for the Arts, New York City Department of Cultural Affairs, NYSCA, National Performance of Network, New England Foundation for the Arts, JPMorganChase, Time Out New York and Con Edition. DTW’s Family Matters Series is supported by Con Edison. DTW Digital Programs are made possible with major support from The City of New York, The New York City Council, The Department of Cultural Affairs and The Surdna Foundation. DTW is grateful to the following public institutions for their continued support: New York City Council, New York City Department of Cultural Affairs, New York City Department of Small Business Services, New York State Council on the Arts, New York State Department of Parks, Recreation and Historic Preservation and the National Endowment for the Arts. With Gratitude: For continuous exemplary support, DTW is grateful to Altria Group, Inc. and JPMorgan Chase. Among the private foundations providing leadership support to DTW are: Arts Midwest, The Louise and Arde Bulova Fund, Capezio/Ballet Makers Dance Foundation, The Carnegie Corporation of New York, The Ford Foundation, The Foundation for Contemporary Performance Arts, The Doris Duke Charitable Foundation, The Mertz Gilmore Foundation, Harkness Foundation for Dance, Horace W. Goldsmith Foundation, The Greenwall Foundation, The William Randolph Hearst Foundations, The Jerome Foundation, The Andrew W. Mellon Foundation, The National Dance Project through the New England Foundation for the Arts, The National Performance Network, The Jerome Robbins Foundation, The James E. Robison Foundation, The Rockefeller Brothers Fund, The Rush Philanthropic Arts Foundation, The Fan Fox & Leslie R. Samuels Foundation, The Scherman Foundation, The Adolph and Ruth Schnurmacher Foundation, The Peter Jay Sharp Foundation, The Shubert Foundation, Inc., The Starr Foundation, The Surdna Foundation, Trust for Mutual Understanding and The Lila Acheson Wallace Theater Fund of the New York Community Trust. Additional Endowment Funds are provided by: The Doris Duke Charitable Trust, Rockefeller Brothers Fund and The Fan Fox & Leslie R. Samuels Foundation. DTW also thanks its Corporate Partners for their valuable support: Altria Group, Inc., Con Edison, Goldman, Sachs & Co., HX Magazine, Independence Community Bank, JPMorgan Chase, Limited Brands, New York Times Company and Time Out New York.